IWI strategies have defined detailed use cases, based on target scenarios defined in the sub-projects SECONDS, INCA, and EMIC. Here, the definition of requirements for IWI strategies based on use cases have been set and an iterative design, prototyping, and user testing of IWI strategies based on the initial requirements have been developed. In the sub-project "IWI strategies" the theatre technique was used to carry preliminary evaluations before rapid prototypes were built in software and tested in more sophisticated environments. Different options for IWI strategies can be emulated and assessed in simpler simulators and mock-ups. 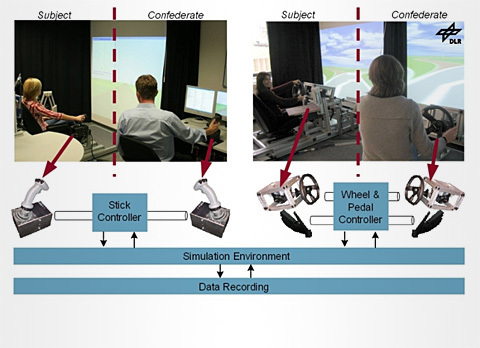 The theatre technique was a technique where a second person (the so called confederate) next to the driver can emulate the assistance system/automation while being haptically linked with the driver (i.e. by double command). The confederate, representing the active system, can present e.g. an active steering intervention or a deceleration etc via double command which is then directly perceived by the subject. The video shows typical scenes and situations from a simulator study of driver behaviour. It was recorded during a study at the German Aerospace Center (DLR) in 2011. Apart from developing strategies, different conï¿½cepts and tools were introduced and discussed. Additionally, a comprehensive framework for a idealgraphic layout of the vehicle cockpit visual HMI including detailed design drafts for the various visual and acoustic elements was developed. All the IWI strategies, design concepts and tools, and the visual and acoustic elements were applied to the various interactIVe demonstrator vehicles. As a result, the demonstrator vehicles feature individual manufacturer-specific design details while sharing the same underlying strategies, concepts and basic elements of the interaction design. During the last period, the sub-project ï¿½Information, warning and intervention strategies (IWI)ï¿½ focused on experimental studies. Research questions were collected based on literature search performed during the initial design of IWI strategies as well as through ongoing discussions with project members in the vertical sub-projects in interactIVe. ï¿½How can the driver, in an unavoidable accident, be encouraged to steer or brake? Volvo Technology - study I: Rear End Collision Avoidance. Driver reactions to an active steering intervention to avoid a rear end collision. German Aerospace Centre - study I: Collision Mitigation System by steering in a critical intersection scenario. Fiat Research Centre - study I: Continuous Support (information, warning, no intervention). Comparison of warnings with different modalities (auditory, visual, haptic via steering wheel, accelerator pedal, seat belt) for different lateral and longitudinal threats. Volvo Technology - study II: Evaluation of Side Impact Avoidance and Run Off Road systems by steering intervention. Allround Team - study I: Different types of pedal haptics for different scenarios: curve speed, forward collision, speed limit warning. German Aerospace Centre ï¿½ study II: Rear End Collision Avoidance by steering interventions. Evaluation of sequence of warnings and interventions and design of steering recommendation. Fiat Research Centre - study II: Continuous Support. Assessing warning modalities in multiple threats situations. Ford Research Centre in cooperation with Allround Team: Driversï¿½ brake and steering behaviour evaluated in relation to a stationary object on test track. Vehicle capacity compared to driversï¿½ preferred actions. 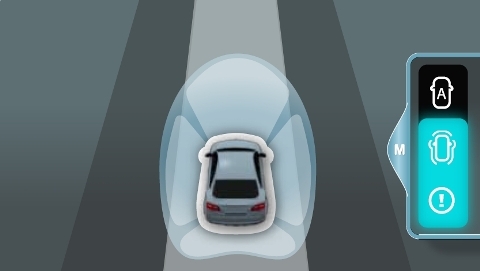 Volvo Cars in cooperation with Volvo Technology: Rear End Collision Avoidance evaluation with brake pulse on test track: Traditional Head Up Display (HUD) and sound compared with HUD, sound and brake pulse. Improvement of dicision strategies for active safety and driver-vehicle-interaction was one of the distinctive missions of interactIVe. In an interview human factors specialist Emma Johansson provided an insight into the ongoing research. What is your specific task in interactIVe and what is your research approach? Emma Johansson: It is our task to investigate IWI strategies for Advanced Driver Assistance Systems (ADAS). This task is performed in close cooperation with the application-oriented sub-projects. The partners involved are Volvo Technology, Centro Ricerche Fiat, Allround Team and the German National Research Centre for Aeronautics and Space (DLR). Our research question is: How do we create a support system with well-integrated functions which is affordable and accepted by the driver? In short, IWI strategies should cover an array of interaction modes, i.e. visual, auditory and haptic output/input. We aim at assisting the driver with steering, braking and acceleration interventions in emergency cases, but also at providing him with relevant unobtrusive information. Two fixed-based driving simulators from the partners Allround Team and DLR for passenger cars and one truck driving simulator at Volvo Technology, all with dynamical traffic and environment simulation. In all three simulators we are able to adjust traffic dynamically and create any environmental condition like snow. Also, we will use two moving-based driving simulators from Fiat and DLR, and one test vehicle from DLR with full drive by wire capability. We also have to implement new software and hardware into the simulators. We expect our first results in fall 2011. What is the particular challenge of your work on IWI strategies in interactIVe? Emma Johansson: If warnings are unsuitable and the intervention is not according to the driverï¿½s expectations of how a situation will evolve, this might lead to that the driver simply shuts the system off or performs counteractions possibly resulting in an even worse situation. Functions should easily be understood and operated intuitively by the driver. They should give the optimal benefit and support in order for the driver to drive safely and they should not counteract against the driverï¿½s intentions. All functions should be controllable by the driver at any time, be well integrated into the overall vehicle interface with as few modes and abilities as possible and with consistent semantics for warnings and intervention.